Yea I'm that guy. I was up at 12:01 on April 10th pre-ordering the new Apple Watch. The way I justify this kind of silliness is twofold. I'm physically old. And there's a part of me that doesn't want to be mentally old. I used to come home from college to see my parents and inevitably the VCR (see I am old) was blinking "12:00". My parents just couldn't get their head around how to reset the time when the power went out. My mom in her infinite wisdom eventually just put a Post-It note over the top of it. I remember thinking, "I'm not going to be that way when I get old". So I tend to jump on new things just so I'm not left in the dust if they catch on. A CEO of a startup in NY claimed that the most important thing in his life was his constant communication with the people around him. In other words his phone. Anything that improved that experience was worth dropping money on. So he would purchase a new iPhone every year. And the promise of this watch is that it improves communication. So I bought one. The "cheap" one. So how is it? Physical: It's sort of what you expect from Apple. It looks great. It's packaged great. It's very comfortable. More comfortable than any other watch I've worn. 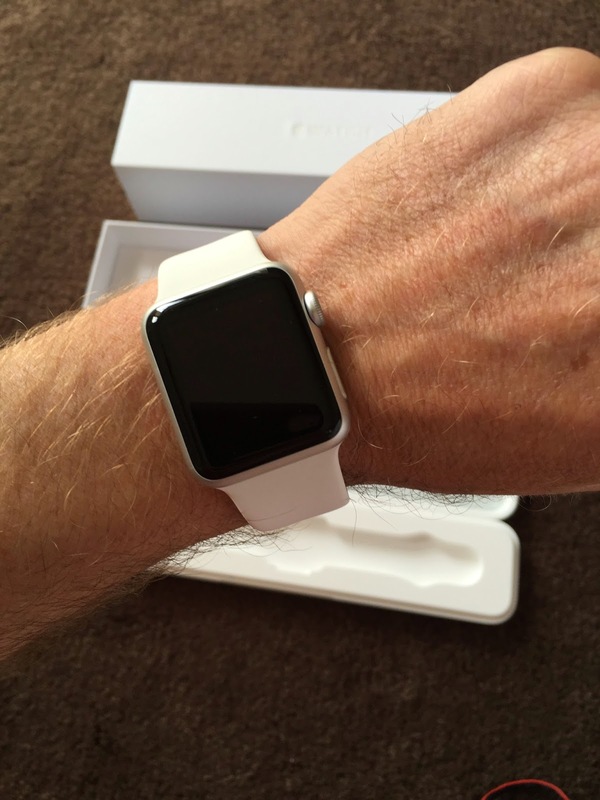 The small 38mm size is fine for my dinky wrists although it's pushing my increasingly poor up-close vision. I've switched around the placement of the watch from both hands and both orientations and I've ironically settled on the right hand (I'm left-handed) with the digital crown pointed toward my shoulder (imagine the orientation below but on my right hand). That seems wrong for a traditional watch but pressing the buttons is actually easier this way. In short it's nice and I don't think anyone will have any problems with the unit. Use Case #1: The one and only use-case that matters is this - I take my phone out of my pocket about 95% less than I used to. This is huge. Is it a necessity? No. But who cares. This isn't about what I need. This is about what I want. And I hate being tethered to the phone when I work. I can wander around and take breaks and be completely connected in a super light touch way. A call comes in and I can take it from the watch. A message comes in and I can take it from the watch. An email comes in and I can read it from the watch. A calendar appointment comes due and I can read it from the watch. If necessary I can grab my phone or computer if the communication warrants it. But in most cases it doesn't. So I have a huge amount of freedom now. Use Case #2: Workouts. In this case the watch isn't perfect. The workouts are built around cardio activities, and I don't do any. I'm all about the HIIT and weight lifting. It does track my heart rate and workout length and in most cases that's enough. I don't need a calorie tracker, but it does that too. And it stores it all so I can get warm fuzzies at the end of the week. We all like warm fuzzier don't we? Use Case #3: Timing. This I usually use when I cook. I set the alarm, and again I don't need to be tethered to my phone. Use Case #4: There isn't one. That's it. For me the extent of the utility of this watch are those three things. I realize there are apps out there but I honestly don't think I need any of them. And frankly those three are enough.